In this course you will learn how to create your first rules project on JBoss BRMS. The project will be built in the JBoss BRMS web-based workbench that allows both developers and business users (e.g. business analysts) to create, manage and maintain business rules projects and business rules. This workbench is called Business Central. We will deploy and run the rules on the lightweight and cloud-ready JBoss BRMS Decision Server. In this scenario you&apos;ve learned how to build a JBoss BRMS Micro-Rules service on OpenShift. We started by defining our repository and project in the JBoss BRMS web-based workbench Business Central. Next, we created our fist data-model and decision-table representing our facts and rules. We made our project available to our OpenShift S2I build process by pushing our project to GitHub. Using the Decision Server S2I template we were able to create our project and JBoss BRMS Decision Server application container image and deploy the container on to OpenShift. Finally we tested our rules using cURL. JBoss BRMS supports many more use-cases and scenarios. Please consult the various online resources (manuals, blogs, demos, forums, etc.) to continue your JBoss Business Rules Management journey. The JBoss BRMS Business Central workbench is provided in this Katacoda image and is automatically loaded and started when this scenario is started. Please observe the output of the terminal to verify that the Workbench is available. Asset/Rules Repository: A Git-based, version controlled, repository in which the BRMS projects and their assets (rules, decision tables, data-models, etc) are stored. Workbench: A set of editors, wizards and tools to allow the user to create and manage business rules. Artifact Repository: A Maven-based repository which stores the (compiled) business-rules projects that can be deployed onto the execution environment. Before we can create our rules project, we first need to configure the repository in which we can store our project assets. To do this, we first need to create a so-called Organizational Unit (OU) in the “Business Central” interface. An OU is a concept within Business Central workbench that defines an entity within your organization. Within Business Central, a repository is always owned by an OU. Click on Add and create a new Organizational Unit with Name and Default Group ID Demos (you can leave the other fields in the screen empty). Give it the Repository Name loan and assign it to the Demos OU we created earlier (leave the Managed Repository checkbox unchecked). We now have a repository in which we can store our project and our assets. The next step is to create the project. Guided Decision Tables: rules written in the form of a decision table. First, make sure to select the "loan" repository in the breadcrumbs right under the text Project Explorer. Now that we&apos;ve selected the correct repository, we can create our project. We&apos;ve now created our first BRMS project and can now start creating rules assets. We will begin with creating our domain-model. The first asset we need to create is our data-model. The data-model defines the rule facts on which we will execute our rules. A data-model in JBoss BRMS can have many forms. As BRMS is a Java-based rules engine, it operates on Java POJOs (Plain Old Java Objects). As such we can both re-use existing (corporate) data-models defined in external JARs (Java Archives), as well as define these POJOs in our rules project as assets. JBoss BRMS provides a simple data modeling tool that allows business users to create their data-models without having to know the Java programming language. We will create a simple data model consisting of 2 classes: Applicant and Loan. Make sure to also save this model using the Save button in the editor. We can now create our rules. Now that we have a data-model for our rules project, we can start writing the rules that will reason over this data-model. In this example project we will write our rules in a decision table. The decision table concept allows a person, skilled in writing rules, to define the layout of the decision table, the conditional columns, the actions to be performed when a rule matches and fires, etc. We basically create a template for the rules. The actual rules are then defined by the individual rows of the decision table, where each row will translate into a single rule. This allows less technical people to easily define and write sophisticated business rules that are executable at runtime. We can now implement our rules constraints. Condition columns in our decision table will define the so called Left-Hand-Side (LHS) of our rules, also know as the when part of a rule. When these constraints are met, the rule will fire and will execute the action defined in the Right-Hand-Side or then part of the rule. Our decision table will consist of 4 Condition columns and one Action column. In this chapter we will define the constraint columns. Now that the Condition columns have been defined, we can work on the Action column. Our rule will contain a single Action column. This column basically sets the approved boolean field of the LoanApplication fact to true or false. I.e. the action of the rule is to define whether the loan application has been approved. We can now implement the rows of our decision table which in fact defines our rules, where each row defines a single rule. We can now implement our rules, we will write 4 rules in total that, depending on your creditscore and the requested amount, will decide whether the loan will be approved or not. A rules session (the session in which facts are inserted and against which rules are evaluated) can be both stateful and stateless. A Stateful Session is a session which is kept open until it is explicitly disposed. This allows the client to keep inserting facts into the session and fire rules against for a longer period of time. This can for example be used in Complex Event Processing scenario&apos;s in which a session accepts a constant stream of events against which rules are evaluated. A Stateless Session is a session which is immediately disposed after the facts have been inserted and the rules have been fired. It&apos;s a one-shot approach. The client does a single request into the session in the form of a set of commands, the session executes these commands (.e.g. insert fact, fire rules), returns the result and disposes the session. This is a common architecture in stateless environments, for example when the rules engine is used to implement a decision (micro) service. We&apos;ve now configured a Stateless Session named stateless in a KIE-Base called default-kiebase. We can now reference this session at runtime when sending requests to the rules engine. The Red Hat JBoss BRMS Decision Server in OpenShift Container Platform uses the so-called S2I, or Source-to-Image, concept to build its OpenShift (Docker) container images. In essence, you provide S2I the source code of your rules project, and the build-system will use Maven to build the KJAR (Knowledge JAR) containing the data model and rules, deploy this KJAR onto the Decision Server and create the container image. When asked for the password, use jbossbrms1! The Git implementation of Business Central uses an older public key algorithm (DAS). Our Katacoda instance supports this algorithm by default, but on other machines, it might be required to add the following settings to your SSH configuration file (on Linux and macOS this file is located at “~/.ssh/config”). This is because our domain model contains Java annotations from the “kie-api” library, however, that dependency is not defined in the “pom.xml” project descriptor of our project. This dependency is not required for builds done in Business Central, as Business Central provides this JAR on the build path implicitly. However, we need to explicitly define this dependency in our “pom.xml” file for our local and Decision Server S2I Maven builds to succeed. Note the “provided” scope, as we only require this dependency at compile time. At runtime, this dependency is provided by the Decision Server platform. git commit -m "Added kie-api dependency to POM." Again, when asked for a password, use jbossbrms1! The JBoss BRMS Decision Server S2I build on OpenShift takes the source code of your project, for example from a Git repository, compiles the sources into a KJAR, deploys the KJAR onto the Decision Server and builds the OpenShift image (detailed information about the xPaaS BRMS image for OpenShift can be found in the manual). Therefore, the S2I build needs to have access to our project’s source code. Because the OpenShift instance in our demo here in Katacoda will not be able to access the JBoss BRMS Business Central Git repository, we will need to make the Git repository available at a place where our OpenShift instance does have access. In this example we will use GitHub (hence a GitHub account is required), but any Git repository (e.g. BitBucket, GitLab, Gogs) will do. We can now push to our upstream repository. Our BRMS Loan Demo project is now available on, and accessible via, GitHub. 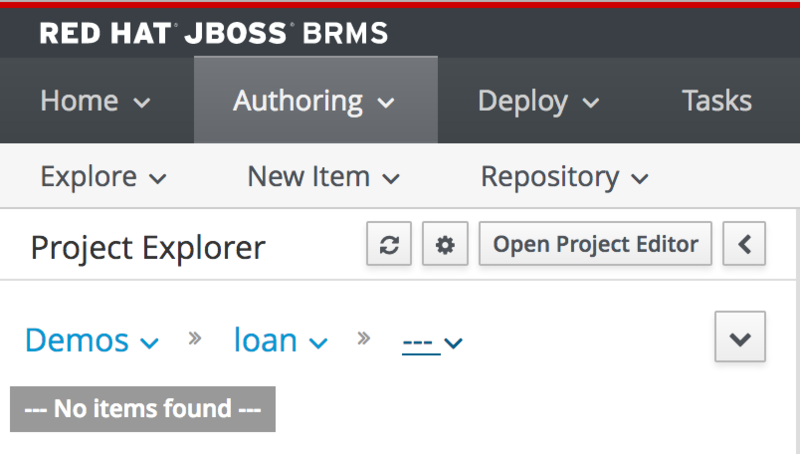 We will now deploy our Loan Demo rules on an OpenShift JBoss BRMS Decision Server. oc new-project loan-demo --display-name="Loan Demo" --description="Red Hat JBoss BRMS Decision Server Loan Demo"
The platform will automatically switch to our new project. We will use the decision-server64-basic-s2i template to define and configure our new application. We point the template to our repositoy on GitHub containing the source code of our Loan Demo rules project"
oc new-app --template=decisionserver64-basic-s2i -p APPLICATION_NAME="loan-demo" -p KIE_SERVER_USER="brmsAdmin" -p KIE_SERVER_PASSWORD="[email protected]" -p SOURCE_REPOSITORY_URL="https://github.com/DuncanDoyle/loan.git" -p SOURCE_REPOSITORY_REF=master -p KIE_CONTAINER_DEPLOYMENT="container-loan10=com.redhat.demos:loandemo:1.0" -p CONTEXT_DIR="loandemo"
new-app: indicates that we want to create a new application in the current project. SOURCE_REPOSITORY_URL: the location of the Git repository that contains our BRMS project (the project containing our rules). SOURCE_REPOSITORY_REF: the Git repository’s branch to use. KIE_CONTAINER_DEPLOYMENT: the name of the KIE Container (in this case container-loan10) and the Maven GAV (GroupId, ArtifactId and Version) of the KJAR to be deployed in this KIE Container (in this case com.redhat.demos:loandemo:1.0). CONTEXT_DIR: the name of the directory in which the S2I image should execute the Maven commands to build the project (KJAR). More information about these properties can be found here. When all commands have executed successfully, a Loan Demo Decision Server container image build should now be running. This can be verified via the “oc” command oc describe build which will provide information of the builds defined on the system. The initial build can take some time as Maven dependencies need to be downloaded. When the build has successfully finished, an OpenShift pod running our rules in a Decision Server should now be available. To validate that a Decision Server instance is running, we open the OpenShift Administration Console and navigate to our Loan Demo project. The Overview page shows our Pod with a blue ring with the number 1, indicating that 1 pod is up and running and ready to go (note that the OpenShift platform allows us to easily scale up and down the number of running loan-demo instances/pods by clicking on the “up” and “down” arrows). With our Decision Server deployed, we can now test our rules. As our Decision Server exposes a REST API, we can simply test our service using cURL. We first need to determine the endpoint exposed by our application&apos;s Route. Note that the application has been approved, as the “approved” field of our Loan object has been set to “true”.